The Sony PXW-FS5 is the ultimate solution if you are looking for a handheld camcorder that is and functional. This model comes with a powerful steady that allows for use in tight places, can be held in the laps and moved to shoot in different places and conditions. Its controls are well designed, and this makes the camcorder excellent when used with one hand from the chest position. This camcorder comes with a Super 35mm Sensor that makes it draw comparisons with its brother model the Sony PXW-FS7 amongst users. The PXW-FS5, however, is a re-design of the other model and has been developed for outdoor shooting especially in some demanding conditions. The first evidence of this is its lightweight which makes it easy to carry around. Its LCD viewfinder and rotatable, the flexible grip makes it possible to mount this camcorder in as much as nine different positions. For field camcorders, it is impossible for the important functions to be easily and fast accessible. The Sony PXW-FS5 ensures that you do not miss any important moment waste any time by providing you with special tools to ensure that shooting parameters are easily changeable. The camcorder’s Smart grip is located as close as possible to its center to ensure that the camcorder does not roll during shooting. You can also use a grip belt for total security and with a bayonet connection, detaching the grip is fast and easy. The Sony PXW-FS5 comes with exceptional sensitivity, and this makes the camcorder as useable past sunset as it is before. Coming with a highly-sensitive 4K Super 35 “Exmor” CMOS Sensor, users get a combination of benefits of using large format sensors and also Super Slow Motion and great readout speeds that go with 4K motion-pictures. The camcorder shoots high-quality recordings at 100Mbps 4K and shortly, users can expect to use the camcorder in recording RAW in external storages. This makes the Sony PXW-FS5 a great working solution for today and tomorrow needs. With the Sony PXW-FS5’s E-mount flexibility, users can use different lenses such as cinema and SLR lenses and a third party adaptor. This makes the camcorder economical for future use as the main body can be attached to latest lenses and still be useable. This camcorder model delivers an exceptional 240 frames per seconds (fps) slow motion recording in Full HD XAVC 10bit 4:2:2. The best thing about this camcorder is that it does so without sacrificing important aspects such as crop factors, angle view and bit depth of the sensor to achieve the 10x Super Slow Motion feature. To enhance flexibility during shooting and for non-interruptions, the Sony PXW-FS5 comes with two media slots. When using the Relay mode, recording switches automatically to the second memory card as soon as the first one is full. The Simul mode allows for concurrent recording of both memory cards. The recording in Simul mode can be handed independently using the three Start/Stop buttons available with the model. You can connect wireless microphones and control them via the camcorder. 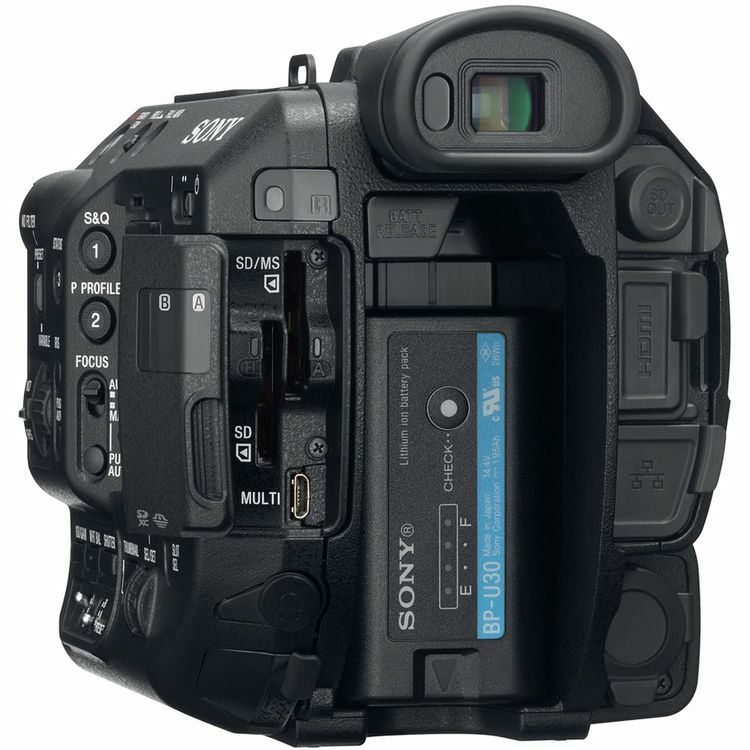 Supporting the Multi-Interface (MI) Shoe technology by Sony, you can switch your Sony PXW-FS5 camcorder in a coordinating manner with other Sony accessories attached to it. 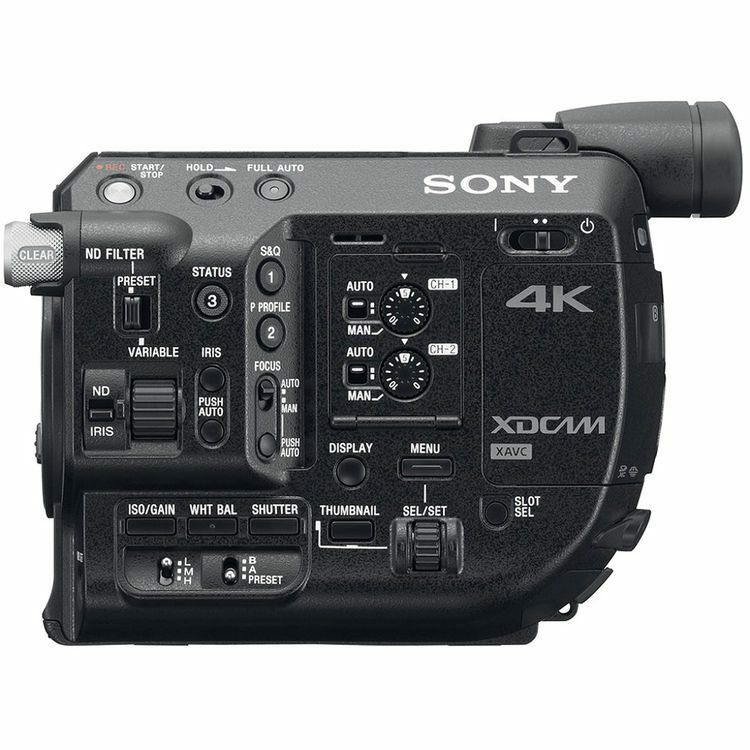 The Sony PXW-FS5 is also ideal for shooting in confined spaces such as inside a car since it comes with two XLR connectors that make it applicable in different conditions. You can control your camcorder from a connected tablet or smartphone. It is also possible to live stream recordings over a Wi-Fi or LAN network. When used with the correct devices, one-touch authentication is possible making it an easy to use the camcorder for group recording. Record 4K at 60/50fps in FS RAW using an external recorder to go beyond what anyone ever imagined for a camcorder that weighs just 0.8kg. (*1) Requires Version 2.0 firmware or above, & CBKZ-FS5RIF paid upgrade with suitable external recorder. Deliver stunning High Dynamic Range imagery with no colour grading needed thanks to Hybrid Log-Gamma (HLG). Shoot, edit and view content in HLG to deliver quickly, without compromising on imaging expression and quality of content. (*2) Requires Version 4.02 firmware or above. FS5 is the world’s first Super35mm camcorder with a builtin electronic variable Neutral Density (ND) filter. You can rely upon FS5 to maintain optimum exposure so you get the shots you need – without changing shutter speed or depth of field. Auto ND mode(*4) also delivers auto exposure with cine lenses, rangefinder glass and third-party SLR lenses. (*4) Requires Version 2.0 firmware or above. Much has been speculated about what will be the feature of Sony PXW-FS5 II versus the current one. As NAB 2018 is approaching, the guessing is becoming simple now. I believe Sony will Stop market PXW-FS5K ( body with Lens ) same as previous case of PXW-FS7K, and Sony will continue to market PXW-FS5 ( without lens ) and PXW-FS5 II. So what is Mark II. 3. Last but not least, the most important one, 120fps High frame rate upgrade. I am pretty sure the above is quite accurate, since it cost Sony nothing to unlock it and allowing customer to have greater value of camcorder and most importantly it help Sony to generate more revenue in time to come. Together with my colleague/crew and we have made combined purchased or 4 x PXW-FS5K. Both the clients and crew are happy with end result of the footages. I need to get few more project to recover my investment. Thanks Expandore for the patient and assistance ,even we are down with the cameras, Expandore is fast to react and make an efforts to get an loan set for us. Thanks for the great service. Sony PXW-FS5 can be considered the younger brother of PXW-FS7. It’s using the same Super 35mm Sensor and shares many features of PXW-FS7. 1) Size PXW-FS7: Basically is a shoulder mount camera, with telescopic handle & grip and the versatile viewfinder to suit different shooting position. PXW-FS5: With modular design for handheld and for drone application. The body only weights approx. 800g. 2) Internal Recording PXW-FS7: Full 4K (4096 x 2160) 4:2:2 10 bit XAVC video up to 60fps PXW-FS5: UHD (3840 x 2160) 4:2:0 8 bit XAVC video up to 30fps Both record 10 bit 4:2:2 Full HD video albeit FS7 has the codec with higher bit rate. 3) 4K RAW Output: PXW-FS7: With optional XDCA-FS7 Extension Unit, output 12-bit 4K RAW video PXW-FS5: Currently not yet available. Future firmware upgrade expected to come with “FS RAW”, estimated to be early 2016. 6) Slow Motion: PXW-FS7: Up to 180fps continuously in Full HD PXW-FS5: Up to 240fps in Full HD with 8 seconds buffer It’s a good choice especially for outdoor shooting because of its excellent video quality, ergonomic & lightweight design and the professional features. Just tested the cameras yesterday, I must say cameras of this handy size met our filming requirement. The recording format I used was AVCHD ( NOT 4K) and I did it in simultaneous recording mode, with this I would have a back up copy for myself. One of which will be given to my client The only problem I have to is to get myself familiar with the various function buttons, but this is no big deal just a matter of time, I got use of it. One thing worth questioning is, why each time when new card was inserted, the cameras would prompt me a remark asking whether I would need to repair the card, CAN YOU EXPLAIN. The other fact is I like the light weight of the cameras as compared to My PXW-X160.